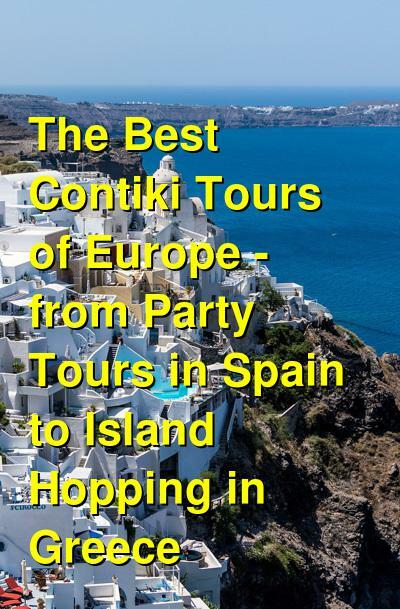 If you're a young traveler looking for a tour with a focus on nightlife, partying, and having a good time, then Contiki is one of the most popular tour companies around and Europe is one of the most popular destinations. With its cosmopolitan cities, basic comforts and easy accessibility, Europe makes a great destination for new travelers. Contiki offers a wide variety of tours that go to Europe (well over 100 options available). There are region-wide tours that go through a wide variety of countries and cover a large geographic area. There are also more country specific tours that go to one or two countries. Below are just a few of the options available through Contiki. Contiki offers a range of tours that focus exclusively on one country. Whether you're interested in visiting Italy, Spain, Greece, England, or elsewhere, you're likely to find a good tour. These tours are usually a week or two in length and visit a handful of locations ranging from major cities to smaller towns. Some of the most popular single country tours offered by Contiki are listed below. This thirteen day tour of the Greek Islands takes visitors to a handful of islands. You'll enjoy visits to Mykonos, Ios, Santorini, and Athens, and you'll be given plenty of time to explore the quaint villages and beautiful landscapes. Spend some time lounging on the beaches or wander through the charming countryside while you soak up the area's culture and atmosphere. You'll dine at delicious restaurants, shop in the local stores, and soak up everything that the Greek Islands have to offer, all in the company of a fun group of young travelers. The tour begins and ends in Athens where you'll have a couple of days to explore. Then you'll travel by boat to Mykonos and enjoy the island's quaint town, picturesque windmills, and delicious cafes. From Mykonos you'll move on to Santorini where you'll visit the famous churches, take a dip in the ocean, or enjoy the famous sunset of Oia. You'll then move on to Ios, which is a bit more rugged than the other islands, but no less charming. From Ios, head back to Athens before saying goodbye to this beautiful country. This twelve day tour of Italy takes travelers to a diverse set of destinations. You'll visit Rome, Florence, Milan, Venice, Sorrento, Capri, Pompeii, Verona, Lake Garda, the Riviera, Pisa, and the Chianti Region while soaking up the country's beautiful culture, cuisine, and nightlife. You'll learn to make pizza, sip wine in the countryside, and dine on many delicious local meals, all while you make friends who will last a lifetime. This tour covers a lot of ground and offers a variety of unique experiences in a short amount of time. You'll cover more distance and see more places than you'd likely be able to do on your own. You'll visit the Vatican City, wander the streets and canals of Venice, visit world renowned museums in Florence, and see Sorrento, Capri, and Pompeii, all in under two weeks. If you want to take advantage of your time in Italy with a diverse range of experiences, then this trip is for you. This eight day tour of Ireland takes visitors to a number of world famous sites including a visit to Jameson's Distillery and Giant's Causeway. You'll make a number of stops around the Emerald Isle including Dublin, Kilkenny, Cork, Blarney, the Cliffs of Moher, Galway, Londonderry, Giant's Causeway, and Belfast. If you're hoping to sip Guinness and enjoy Irish stew with a group of likeminded young travelers, then this is the trip for you. You'll start and end your trip in Dublin where you'll get to visit a variety of pubs and get to know your "trip manager". From there you'll head to Kilkenny which you'll be able to explore on bicycle, and then on to Cork, where you can try whiskey at Jameson's Distillery. From Cork you'll move on to Galway, stopping at the Blarney Stone and the Cliffs of Moher en route. From Galway you'll head to Londonderry for a night, Giant's Causeway, and then Belfast for another night. Finish your trip with a final visit to Dublin, before heading home. This fourteen day whirlwind tour of Spain takes visitors to a number of cities and sights throughout the country. You'll visit Madrid, Segovia, Bilbao, San Sebastian, Pamplona, Zaragoza, Barcelona, Ibiza, Granada, Gibraltar, Seville, Cordoba, and Toledo. You'll have plenty of late nights hitting the best bars and clubs, and you'll have opportunities to soak up the Spanish culture and atmosphere. If you want to see as much of Spain as possible in a short time, then this tour is a good option for you. This trip starts and ends in Madrid, where you'll meet your "trip manager" and have a couple of days to get to know the city. From there you'll begin a circuit that takes you through a wide variety of cities, landscapes, and interesting parts of Spain. This trip let's you see so many places by making a lot of stops while traveling between cities. In one day you may visit two or three towns. This tour even manages to fit in the world famous party destination of Ibiza, which you'll reach by flight. This four day adventure takes you through Iceland's unique and beautiful landscape. You'll be based in Reykjavik and have the opportunity to bath in the world famous Blue Lagoon. You may even see the Northern Lights during your time here. You'll get to see the country's famous geyser's, waterfalls, and ancient volcanoes, all with the convenience of a tour and organized transportation. At night you'll have ready made friends to head out into the city's famous nightlife where can visit some of the best bars and clubs. This short trip is just long enough to soak up the highlights of Iceland without a lot of hassle. Another Greek tour offered by Contiki, Spotlight on Greece takes visitors on an eight day tour of Greece and the Mediterranean. You'll visit Athens, Corinth, Mycenae, Olympia, Delphi, Mykonos, Kusadasi, Patmos, Crete, and Santorini. You'll have three days cruising the Cycladic islands after a few days exploring other parts of Greece. If you want a diverse trip that makes the most of a short amount of time, then this is it. This tour fits a lot into a short amount of time by passing through several destinations in one day. You'll spend only a few hours in some places, but you'll catch the highlights and be able to see a diverse number of places throughout Greece. This tour doesn't waste a second as it takes you through some of the most interesting and beautiful parts of Greece. This nine day trip takes visitors around Croatia stopping at Split, Markarska, Korcula, Dubrovnik, Trstenik, and Hvar. You'll be able to soak up some sun, enjoy the local culture, and take advantage of the area's vibrant nightlife. The tour begins and ends in Split, where you'll have a bit of time to meet the fellow travelers on your tour and your "trip manager." You'll spend the next night in Markarska before heading on to Korcula with its beautiful Venetian architecture and stone streets. From there you'll have two nights in Dubrovnik, which is arguably one of the most famous seaside towns in Croatia. Finally, spend some time in Trstenik and Hvar before heading back to Split. This six day tour of Scotland will take you through castles, highlands, and old cities. You'll start in Edinburgh and end in Glasgow, passing through St. Andrews, the Scottish Highlands, the Isle of Skye, the West Highlands, and Stirling en route. You'll spend two nights in Edinburgh exploring the ancient city and getting to know your new travel companions before you head on to the Scottish Highlands, passing through St. Andrews on the way. You'll get to take a lake cruise on Loch Ness and hear stories about the area. The next day you'll pass through the Isle of Skye and spend the night in the West Highland's and see Britain's highest mountain. From there head to Stirling and on to Glasgow to complete your trip. Whether you want to visit the Mediterranean, Scandinavia, or the Baltics, Contiki has a wide variety of regional tours to choose from. These tours take you through several countries and let you see a few different cultures. They usually last a few weeks with a few stops in each country. Below are some of the most popular regional tours offered by Contiki. If you want to see both Scotland and Ireland then this thirteen day tour will take you through both. You'll start in Edinburgh and end in Dublin, passing through St Andrews, the Scottish Highlands, the Isle of Skye, West Highlands, Stirling, Glasgow, Larne, Kilkenny, Cork, Blarney, the Cliffs of Moher, Galway, Londonderry, Giant's Causeway, and Belfast over the course of two weeks. This is really a combination of the Ireland and Scotland tours described above. It offers an efficient way to see both countries and makes maximum use of your time by often stopping is two or more places in one day. If you're short on time and don't want to deal with the hassle of transportation, then this tour is a great option. If you want to experience the Mediterranean, then this ten day tour is a great option. It follows along the Mediterranean coastline and lets you see beautiful blue water, Roman architecture, dramatic coast lines, and quaint villages. The tour starts in Barcelona and ends in Rome and you'll pass through Italy, France, and Spain. You'll spend time in amazing places such as Nice, Monaco, Cinque Terre, Florence, Sorrento, and Pompeii. With just ten days to see a diversity of countries and towns, this tour really makes great use of its time. You can expect to spend a decent amount of time on the bus, but the route offers great views of the water and countryside. You'll be mesmerized the whole way while you soak up the views out the window and chat with your new friends. You'll get to visit a large number of locations by making several stops in one day. You'll never be bored as you visit some of Europe's most famous areas. This fifteen day tour through Spain, Morocco, and Portugal takes you through cathedrals, kasbahs, and medinas. You'll see the diverse cultures that exist in this region and visit seven World Heritage Sites. The tour begins and ends in Madrid, also visiting Granada, Fez, Marrakech, Casablanca, Rabat, Assilah, Gibraltar, Seville, and Lisbon. This tour lets you see a variety of cities and towns in Morocco. From the famed cities of Fez and Marrakesh to the picturesque kasbah of Assilah, you'll have time to soak up much of Morocco's unique culture and atmosphere. A stop in Lisbon will let you enjoy a bit of Portugal, and you'll have a few days in several cities in Spain as well. The Eastern Trail takes travelers through several off the beaten path places in Eastern Europe. You'll also see some more popular hotspots like Vienna, where the tour starts, and Rome, where the tour ends. Other destinations include Auschwitz, Krakow, Banska Bystrica, Budapest, Lake Bled, Ljubljana, and Venice. This tour takes visitors through six countries, with one or two stops in each. You'll get a glimpse of a diversity of cultures that will leave you itching to come back for more. If you're short on time, but want to cover as much ground as you can, then this tour is for you. This thirteen day tour through Scandinavia takes visitors to the many unique offerings found in this region including hot saunas, museums, and local restaurants. You'll start in Berlin and visit Copenhagen, Oslo, the Hardangervidda Region, Voss, Sognefjord, Geiranger Fjord, Lom, Lillehammer, Gjovik, Stockholm, and finish in Helsinki. Scandinavia is a notoriously expensive region to visit, and a Contiki tour offers you a slightly more affordable way to see the region while avoiding the hassle and cost of organizing your own transportation. You'll see a diverse selection of cities and destinations and you'll definitely make the most of your time and money while you'll in the area. This 9 day tour takes you through London and Paris with an additional stop in Amsterdam. You'll have time to enjoy the cities and their amazing cultures. You'll sip coffee in cafes, enjoy the best nightlife the city's have to offer, and soak up the unique sights that are found in each city. With several days in London, you'll have plenty of free time to explore on your own. Make sure you ask your trip manager for the best insider tips on where to go and what to see. From London, you'll stop in Dover before heading on to Paris. In Paris, you'll have a few days to taste croissants, sip wine, and enjoy this fascinating city. From Paris you'll pass through Belgium and make your way to Amsterdam where you can enjoy this eclectic and unique city. This nine day tour visits Berlin, Prague, and Vienna. You'll have enough time to enjoy a Czech feast in a Prague tavern, visit Vienna's famous St. Stephen's Cathedral, and hang out with new friends in some of the area's best bars and clubs. You'll begin your tour in Berlin where you can enjoy shopping, sightseeing, and the nightlife. From Berlin you'll pass through Dresden on your way to Prague, with its fascinating Old Town and beautiful architecture. After a few days in Prague you'll make your way to Vienna stopping at Kutna-Hora en route. The Adriatic Spirit tour, which lasts eight days, gives travelers plenty of time in the sun and along beautiful coastlines. You'll start your adventure in Split and finish in Rome, visit Neum, Dubrovnik, Budva, Tirana, Corfu, Bari, Salerno, and Pompeii along the way. This tour visits some truly unique parts of Europe. You'll enjoy drinks in Split, wander the streets of the Old Town in Dubrovnik, and soak up an evening in Tirana. You'll enjoy delicious food and shopping in Corfu and get a taste for Italy in Salerno, Pompeii, and finally Rome. If you're looking for a more comprehensive tour of Europe, then Contiki has no shortage of options. Many of these tours cover a lot of ground in a short amount of time, so you can expect lots of time on buses and shortened stays in cities. Still, if you're short on time and want to see as much as possible, then these Contiki tours may be your best bet. This thirteen day tour of Europe will take you through nine countries. You'll begin and end your tour in London and visit such famed cities as Belgium, Amsterdam, Munich, Venice, Rome, Florence, and Paris. You'll also have stops in Dover, Calais, the Rhine Valley, Innsbruck, and Lucerne. This whirlwind tour will give you a taste of a variety of countries and cultures throughout Europe, and leave you wanting to come back for more. This tour manages to fit a lot of stops into a relatively short amount of time. You'll catch a glimpse of many different areas, and experience just enough to leave you wanting more. If you're short on time and don't want to deal with the hassle and expense of planning your own transportation, then this tour is an efficient way to see a lot of Europe. You'll travel with a group of ready made friends as you see a wide diversity of locations. Come prepared to hit the ground running, because you'll move quick and won't slow down until your flight home. This ten day tour of Europe also begins and ends in London and visits eight countries. It's comparable to Contiki's European Discovery tour, but it has less time in Austria and leaves off visits to Rome and Florence. This tour is ideal for travelers who can't spare a full two weeks but still want to see as much of Europe as possible. With slightly less locations, you'll still move fast but will spend a little less time on the road. This eleven day, eight country tour begins and ends in London and follows a similar route to the above tours. It visits London, Dover, Calais, Belgium, Amsterdam, the Rhine Valley, Munich, the Austrian Tyrol, Venice, Lucerne, the Swiss Alps, and Paris. You'll spend more time in the Swiss Alps with this tour than with the European Discovery tour, but you'll skip much of Italy. It's all about priorities when you're visiting Europe so think about your interests and time and pick a tour that best meets your needs. This fifteen day, eight country tour offers a different route through Europe. It also begins and ends in London, but travels through Dover, Calais, Paris, Fontainebleau, Beaujolais, the Riviera, Monaco, Pisa, Florence, Rome, Venice, the Austrian Tyrol, Munich, Dachau, the Rhine Valley, Edam, Amsterdam, and Belgium. This tour fits a lot in to a short amount of time back following an efficient route through some of the most popular destinations in Europe. You'll visit some of the top museums in Paris, walk along the canals of Venice, and drink beer in Munich. You'll see the famed Riviera and admire world famous art in Florence, all in the company of your new friends. This ten country, twenty day tour takes travelers through diverse parts of Europe with a unique range of cultures and experiences. You'll begin and end in London and visit Dover, Belgium, Amsterdam, Edam, Berlin, Dresden, Prague, Dachau, Munich, the Austrian Tyrol, Venice, Rome, the Chianti Region, Florence, Pisa, Lucerne, and Paris. You'll see the highlights of many great countries and enjoy a very dynamic and wide-sweeping tour of the region. You'll walk the streets of Paris, eat gelato in Rome, explore the castles and cathedrals of Prague, and hit the best bars in Amsterdam. If you want to see as many parts of Europe as possible, then this tour is a good option. This nineteen day tour of Europe is very similar to the European Inspiration tour except that it skips stops in Dachau, the Chianti Region, and Pisa. The European Quest spends 26 days visiting eleven countries. Like the other tours, it starts and ends in London and it visits Dover, Paris, Bordeaux, Saint-Jean-de-Luz, San Sebastian, Zaragoza, Barcelona, Nice, Monaco, Cinque Terre, Pisa, Florence, Sorrento, Capri, Pompeii, Rome, Verona, Venice, Salzburg, Prague, Dresden, Berlin, Amsterdam, Edam, and Belgium. With almost a month on the road, you'll get to see not only the hot spots around Europe, but also several more off the beaten path locations. You'll see a wide variety of places in Italy, from the picturesque coast to historic Rome and Florence. You'll enjoy a wide reaching route that takes you through France, Spain, Italy, Austria, Germany, and more. If you have the time and resources, then this tour is a great opportunity to experience a lot of different parts of Europe. The European Escapade takes a different route through Europe for 26 days. It starts in London and then visits Dover, Paris, Fontainebleau, Beaujolais, Barcelona, Arles, Monaco, Pisa, Florence, Rome, Venice, Vienna, Munich, Dachau, the Austrian Tyrol, Liechtenstein, Lucerne, the Swiss Alps, Heidelberg, Rhine Valley, Edam, Amsterdam, Belgium, and London. This tour has less tie in Italy when compared to the European Quest, but it lets you see a bit more of Central Europe. It's a fun and diverse route through some of the most fascinating countries in Europe, and you won't be disappointed. The Original is one of the longest and most comprehensive tours offered by Contiki. You'll spend 47 days traveling through 21 countries. You'll start in London and head south all the way to Spain. From there you'll head east through Italy, Greece, and Turkey. You'll also pass through Macedonia, Albania, Montenegro, Croatia, Hungary, Slovakia, Austria, the Czech Republic, Germany, Switzerland, the Netherlands, Belgium, and back to London. This high adventure trip involves a lot of camping and lots of unique experiences with new friends. If you really want the most comprehensive and diverse trip through Europe, then this is it. It visits many off the beaten path destinations as well as some of Europe's most popular and famous cities. If you have the time, then this trip is truly once in a lifetime.